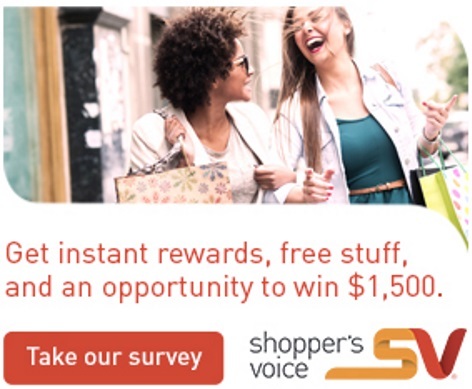 New year, new Shoppers Voice survey! Complete the survey to get instant rewards, free stuff and an opportunity to win $1500! This year you get offered money savings right after you finish the survey! You’ll receive a welcome email and money-saving rewards based on the responses that you provided in the survey within a few minutes. It doesn’t end there, they'll also be sending you coupons, free samples and more special offers throughout the year! You’ve also been automatically entered into the Shopper’s Voice sweepstakes for $1,500 in this month’s draw. This survey takes some time so be sure you start it when you are available to sit down and complete it all the way through. Please only do this survey once a year, it does not count if you do it over and over and your answers will not be submitted. Complete the Shoppers Voice 2017 survey here.